Com rs of Haberdashers Hall. MR. Thomas Chaloner reports from the Council of State, A Letter from the Lord Fairfax to the Lord Warreston, Lord President of the Council of State, dated the Twentieth of July 1659, touching the Duke of Buckingham: And also, The humble Petition of George Duke of Buckingham: Which were read. Ordered, That it be referred to the Council of State, to take such Security of George Duke of Buckingham, as they shall think fit, with all convenient Speed, for his Submission to the Government of this Commonwealth, and for his peaceable and quiet Living and Demeanour under such Government: And thereupon to give him Liberty and Protection for his longer continuing here, if they see Cause; and, in the mean time, the said Duke not to incur the Penalty of the late Act, intituled, An Act against Delinquents. Ordered, That Mr. Martin do bring in the Declaration, in his Hands, on Monday Morning next: And that the Committee to whom it was referred to prepare the said Declaration, do meet this Afternoon. Colonel Rich reports from the Committee to whom the Petition of Major-General Overton was referred, That, 14 May 1652, it was resolved by this Parliament, That Lands of Inheritance in Scotland, of the clear yearly Value of Five hundred Pounds, be settled upon Colonel Robert Overton, and his Heirs, reserving the yearly Rent of One hundred Pounds to the Use of the Commonwealth: That Richard Saltenstall and Samuell Desbrowe, Commissioners for Sequestrations and confiscated Estates in Scotland, appointed by the Commissioners of Parliament of the Commonwealth of England for ordering and managing Affairs in Scotland, to whom it was referred to set forth the said Lands, and to put him in quiet Possession thereof, did, by their Deed, and their Hands and Seals, bearing Date the Twenty-third of September 1652, set out to the said Colonel Robert Overton, and his Heirs, the Manor-House of Inch Martin, with all the Appurtenances thereof, and divers other Lands in the said Deed expressed, late belonging to the Earl of Leven, of the true yearly Value of Five hundred Pounds Sterling: and thereby reserved One hundred Pounds Rent yearly for the Use of the Commonwealth; and thereof quiet Possession was given to the said Robert Overton the Seventeenth Day of September following, as by Livery indorsed upon the said Deed, appeareth. By virtue whereof the said Robert Overton entered and received the next Year's Rent at Two Half-years Payments; but afterwards the late General Cromwell, calling himself Protector, did oust the said Robert Overton of his said Lands, and caused General Monck, by his Order, to put the said Earl of Leven in Possession; who hath so continued about Five Years, to the Damage of the said Robert Overton, Two thousand Pounds. Whereupon the Committee humbly present it to the Parliament, as their Opinion, That the said Robert Overton of Right ought to be re-invested and re-possessed of the Lands; and that Order be made to the Commander in Scotland for doing thereof: And that the said One hundred Pounds yearly Rent, reserved to be paid to the Commonwealth, be also settled upon the said Robert Overton, and his Heirs for ever, in Satisfaction of his Loss and Damage sustained, by being out of Possession of the said Lands for about Five Years. All which they humbly leave to the Consideration of the Parliament. The humble Petition of Alexander Earl of Leven was read. Ordered, That this Report be re-committed: And that the Petition of the Earl of Leven be referred to the said Committee; and that they examine Matter of Fact; and state it; and report it to this House; and also to consider of the Losses and Sufferings of Major General Overton, as well by Loss of the Mesne Profits, as otherwise; and how he may have Satisfaction; and present their Opinion therein to this House: And that Mr. Say, Sir James Harrington, Mr. Alderman Pennington, and Sir Thomas Wroth, be added to that Committee. Mr. Attorney-General reports a Proclamation, commanding John Mordant Esquire, Son to the late Earl of Peterborough, to render himself to the Parliament: Which was read the First and Second time. Ordered, That this Proclamation be referred to Mr. Attorney-General, Colonel Martyn, and Mr. SolicitorGeneral; to withdraw, and amend this Proclamation, according to the Debate of the House. 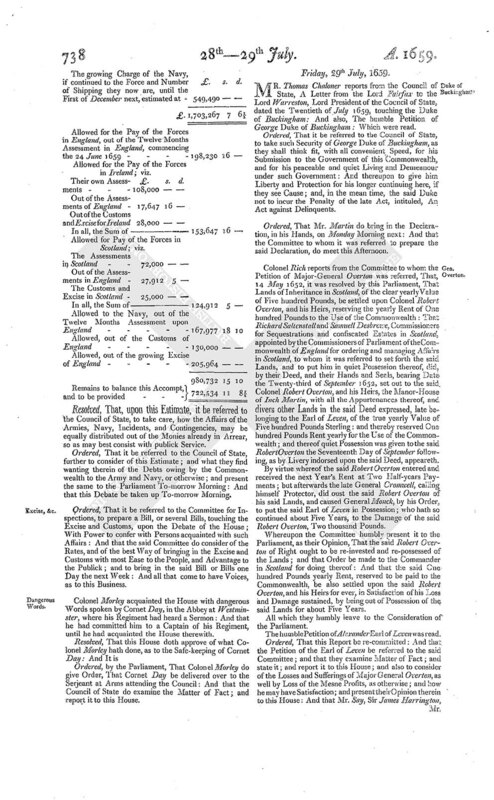 Ordered, That it be referred to the Members of this House, of the Council of State, to consider of Persons most dangerous to the Commonwealth; and prepare a Proclamation, with a Blank for the Reward of such Person or Persons as shall discover and bring in the said Persons, or any of them; and report it to this House. Colonel White reports from the Committee of Inspection of the Treasuries, That several Sums of Money are due to the State by Farmers of the Excise and Customs. Ordered, That the Bill concerning the Sequestration of the Estates of the Farmers of the Customs be brought in on Monday Morning next. 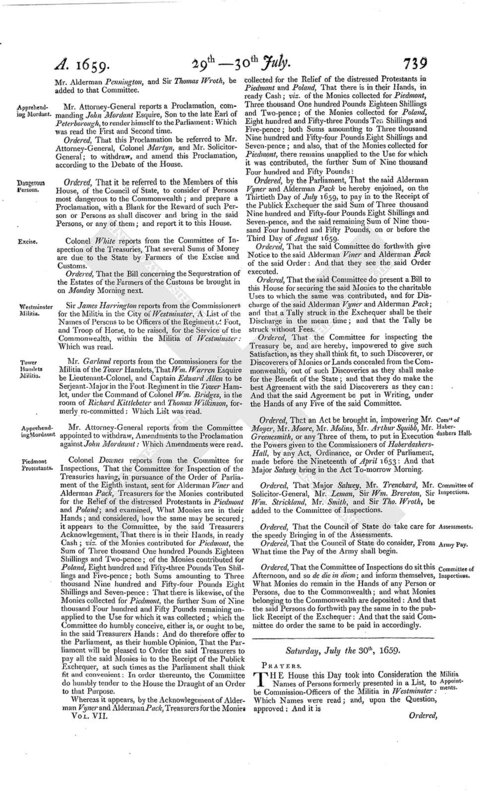 Sir James Harrington reports from the Commissioners for the Militia in the City of Westminster, A List of the Names of Persons to be Officers of the Regiment of Foot, and Troop of Horse, to be raised, for the Service of the Commonwealth, within the Militia of Westminster: Which was read. Mr. Garland reports from the Commissioners for the Militia of the Tower Hamlets, That Wm. Warren Esquire be Lieutenant-Colonel, and Captain Edward Allen to be Serjeant-Major in the Foot Regiment in the Tower Hamlet, under the Command of Colonel Wm. Bridges, in the room of Richard Kittlebeter and Thomas Wilkinson, formerly re-committed: Which List was read. Mr. Attorney-General reports from the Committee appointed to withdraw, Amendments to the Proclamation against John Mordaunt: Which Amendments were read. Colonel Downes reports from the Committee for Inspections, That the Committee for Inspection of the Treasuries having, in pursuance of the Order of Parliament of the Eighth instant, sent for Alderman Viner and Alderman Pack, Treasurers for the Monies contributed for the Relief of the distressed Protestants in Piedmont and Poland; and examined, What Monies are in their Hands; and considered, how the same may be secured; it appears to the Committee, by the said Treasurers Acknowlegement, That there is in their Hands, in ready Cash; viz. of the Monies contributed for Piedmont, the Sum of Three thousand One hundred Pounds Eighteen Shillings and Two-pence; of the Monies contributed for Poland, Eight hundred and Fifty-three Pounds Ten Shillings and Five-pence; both Sums amounting to Three thousand Nine hundred and Fifty-four Pounds Eight Shillings and Seven-pence: That there is likewise, of the Monies collected for Piedmont, the further Sum of Nine thousand Four hundred and Fifty Pounds remaining unapplied to the Use for which it was collected; which the Committee do humbly conceive, either is, or ought to be, in the said Treasurers Hands: And do therefore offer to the Parliament, as their humble Opinion, That the Parliament will be pleased to Order the said Treasurers to pay all the said Monies in to the Receipt of the Publick Exchequer, at such times as the Parliament shall think fit and convenient: In order thereunto, the Committee do humbly tender to the House the Draught of an Order to that Purpose. Ordered, by the Parliament, That the said Alderman Vyner and Alderman Pack be hereby enjoined, on the Thirtieth Day of July 1659, to pay in to the Receipt of the Publick Exchequer the said Sum of Three thousand Nine hundred and Fifty-four Pounds Eight Shillings and Seven-pence, and the said remaining Sum of Nine thousand Four hundred and Fifty Pounds, on or before the Third Day of August 1659. Ordered, That the said Committee do forthwith give Notice to the said Alderman Viner and Alderman Pack of the said Order: And that they see the said Order executed. Ordered, That the said Committee do present a Bill to this House for securing the said Monies to the charitable Uses to which the same was contributed, and for Discharge of the said Alderman Vyner and Alderman Pack; and that a Tally struck in the Exchequer shall be their Discharge in the mean time; and that the Tally be struck without Fees. Ordered, That the Committee for inspecting the Treasury be, and are hereby, impowered to give such Satisfaction, as they shall think fit, to such Discoverer, or Discoverers of Monies or Lands concealed from the Commonwealth, out of such Discoveries as they shall make for the Benefit of the State; and that they do make the best Agreement with the said Discoverers as they can: And that the said Agreement be put in Writing, under the Hands of any Five of the said Committee. Ordered, That an Act be brought in, impowering Mr. Moyer, Mr. Moore, Mr. Molins, Mr. Arthur Squibb, Mr. Greensmith, or any Three of them, to put in Execution the Powers given to the Commissioners of HaberdashersHall, by any Act, Ordinance, or Order of Parliament, made before the Nineteenth of April 1653: And that Major Salwey bring in the Act To-morrow Morning. Ordered, That Major Salwey, Mr. Trenchard, Mr. Solicitor-General, Mr. Leman, Sir Wm. Brereton, Sir Wm. Strickland, Mr. Smith, and Sir Tho. Wroth, be added to the Committee of Inspections. Ordered, That the Council of State do take care for the speedy Bringing in of the Assessments. Ordered, That the Council of State do consider, From What time the Pay of the Army shall begin. Ordered, That the Committee of Inspections do sit this Afternoon, and so de die in diem; and inform themselves, What Monies do remain in the Hands of any Person or Persons, due to the Commonwealth; and what Monies belonging to the Commonwealth are deposited: And that the said Persons do forthwith pay the same in to the publick Receipt of the Exchequer: And that the said Committee do order the same to be paid in accordingly.